Suggestions for eight covenant sessions that include discussion topics, music and readings. This addition to the Evensong series offers weekly worship gatherings to foster communication within families and church communities. Ninety minutes long, the 8 gatherings are ideal for 5 families, depending on size, or groups of 20. The orders of service, which can be photocopied for participants, include singing, readings and discussion suggestions. 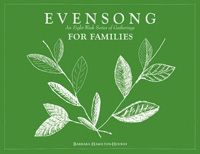 "I have been very happy using Evensong for Families one Friday evening a month since September. We meet in a home with a potluck dinner after Evensong. The parents have been very positive; they like the homework and worshiping with their children. The dinner afterward provides another opportunity for building community. The Evensong materials are great. The children have asked to sing our Evensong songs with motions during the Sunday Worship Service. "